Architectural elements, pottery, textiles, and archaeological objects of native North, Central, and South America dating from 2500 BCE to the period of European contact beginning in 1492. 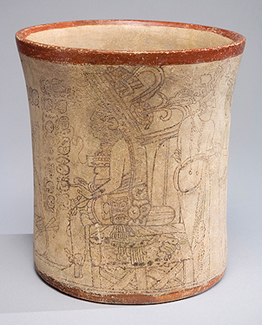 This codex-style vase shows an older lord with headdress and axe characteristic of the rain god Chahk, with two attendants behind him. The attendants wear the sarong and tonsured hair of palace scribes and may be in attendance at a ceremony in order to commemorate the performance of this rite. Before the lord are three figures dressed as hunters and a central figure in the process of embodying the Maize Deity. Four glyphic captions frame the actors. The Indian cultures of the southeast were not unaffected by the highly developed pre-Columbian cultures of Mesoamerica. The clearest evidence of that influence is the development of large earthen temple and burial mounds, usually occurring in series and close to population centers. In the early historic period, the majority of native inhabitants of the southeast were either killed directly or through diseases introduced by the Europeans, or they were forcibly moved to controlled areas in the west. Almost all the artifacts that have survived of these people were found within the context of the mortuary mounds. From the way the artifacts are distributed in these sites, it is possible to infer a structured society that must have employed trained artisans to create the articles necessary to the maintenance of its members' social and religious positions. 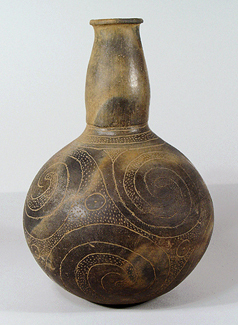 Many aspects of Mississippian culture and stylistic forms of the prehistoric period were continued in historic times. The slightly ovoid body and well-shaped curving neck with flared rim are characteristics of the Caddoan bottle vase. The pattern is referred to as Hodges engraved style. The main body is engraved with a meandering scroll and circles, the interstices punctuated with minute dots. Many of the design components are derived from cult symbols including the sun, moon, wind, and snake motifs. 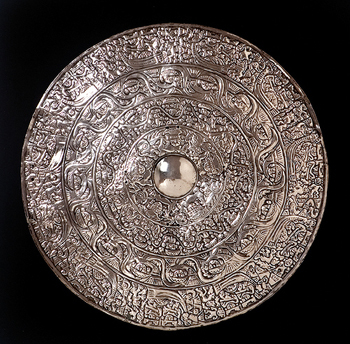 This silver disk was made on the north coast of Peru, by metal artisans who worked for a powerful ruler of the Chimor kingdom between 1000-1400 CE. Chimu is the name given to the style of art produced within this kingdom, the largest and most powerful on the north coast of Peru prior to the Incan Empire. The Lowe Art Museum disk is one of a set of six with nearly identical imagery, and eleven overall, that are housed in museums around the world. It is likely they were commissioned as offerings to accompany the burial of a powerful queen or other very high ranking dignitary of the Chimor kingdom. The complex imagery embossed on the nearly pure silver disk relates to maritime trade between Peru and Ecuador, especially the procurement of the sacred spiny oyster or spondylus shell, which was utilized as a form of currency as well as an important ritual offering.